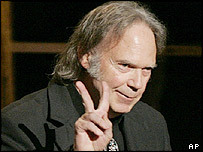 Veteran singer-songwriter Neil Young has been named artist of the year at the Americana Honors and Awards. The 60-year-old released protest album Living with War this year. Young is one of rock's most political artists, with songs like Rockin' in the Free World. At the fifth annual event in Nashville, Tennessee, James McMurtry won the album and song of the year awards. The Americana awards honour music based on the US's traditional country, folk and bluegrass forms. McMurtry, son of Lonesome Dove and The Last Picture Show author Larry McMurtry, won for his album Childish Things and song We Can't Make It Here Anymore. Drive-By Truckers were named group of the year and guitarist Kenny Vaughan was instrumentalist of the year, as well as receiving an instrumentalist lifetime achievement award. Other lifetime achievement awards went to Rodney Crowell for songwriting and Alejandro Escovedo for performing. Charlie Daniels received the Spirit of Americana Free Speech Award. The President's Award, traditionally awarded posthumously for outstanding career achievement, went to the late Mickey Newbury.